In this tutorial, you will learn full details about Excel AutoFit and the most efficient ways to use it in your worksheets. 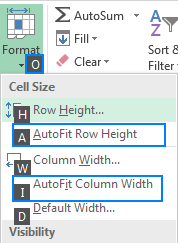 Microsoft Excel provides a handful of different ways to change column width and adjust row height. The easiest way to resize cells is to have Excel automatically determine how much to widen or narrow the column and to expand or collapse the row to match the data size. This feature is known as Excel AutoFit and further on in this tutorial you will learn 3 different ways to use it. 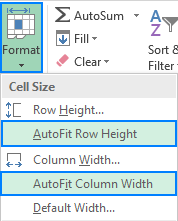 Excel's AutoFit feature is designed to automatically resize cells in a worksheet to accommodate different sized data without having to manually change the column width and row height. AutoFit Column Width - changes the column width to hold the largest value in the column. AutoFit Row Height - adjusts the column width to match the largest value in the row. This option expands the row vertically to hold multi-line or extra-tall text. Unlike column width, Microsoft Excel changes the row height automatically based on the height of the text you type in a cell, therefore you won't really need to auto fit rows as often as columns. However, when exporting or copying data from another source, row heights may not auto adjust, and in these situations the AutoFit Row Height opting comes in helpful. When resizing cells in Excel, either automatically or manually, please bear in mind the following limits to how big columns and rows can be made. Columns can have a maximum width of 255, which is the maximum number of characters in the standard font size that a column can hold. Using a bigger font size or applying additional font characteristics such as italics or bold may significantly reduce the maximum column width. The default size of columns in Excel is 8.43. Rows can have a maximum height of 409 points, with 1 point equal to approximately 1/72 inch or 0.035 cm. The default height of an Excel row varies from 15 points on a 100% dpi to 14.3 points on a 200% dpi. When a column width or row height is set to 0, such column/row is not visible on a sheet (hidden). What I particularly like about Excel is that it provides more than one way to do most things. Depending on your preferred work style, you can auto fit columns and rows by using the mouse, ribbon or keyboard. To autofit one column, position the mouse pointer over the right border of the column heading until the double-headed arrow appears, and then double click the border. To autofit one row, hover the mouse pointer over the lower boundary of the row heading, and double click the border. To autofit multiple columns / multiple rows, select them, and double click a boundary between any two column / row headings in the selection. To autofit the whole sheet, press Ctrl + A or click the Select All button and then, depending on your needs, double click a border of any column or row heading, or both. To AutoFit column width, select one, several or all columns on the sheet, go to the Home tab > Cells group, and click Format > AutoFit Column Width. To AutoFit row height, select the row(s) of interest, go to the Home tab > Cells group, and click Format > AutoFit Row Height. To autofit multiple non-adjacent columns/rows, select one column or row and hold down the Ctrl key while selecting the other columns or rows. To autofit the entire sheet, press Ctrl + A or click the Select All button. Alt + H selects the Home tab on the ribbon. O opens the Format menu. I selects the AutoFit Column Width option. A selects the AutoFit Row Height option. In most situations, the Excel AutoFit feature works without a hitch. There are times, however, when it fails to auto size columns or rows, especially when the Wrap Text feature is enabled. Here's a typical scenario: you set the desired column width, turn Text Wrap on, select the cells of interest, and double click a row separator to autofit the row height. In most cases, rows are sized properly. But sometimes (and this may happen in any version of Excel 2007 to Excel 2016), some extra space appears below the last line of text as show in the screenshot below. Moreover, the text may look correctly on the screen, but gets cut off when printed. Press Ctrl + A to select the whole worksheet. Make any column a fair amount wider by dragging the right boundary of the column heading (because the entire sheet is selected, all the columns will be resized). Double-click any row separator to auto fit the row height. Double-click any column separator to auto fit the column widths. The Excel AutoFit feature is a real time saver when it comes to adjusting the size of your columns and rows to match the size of your content. However, it's not an option when working with large text strings that are tens or hundreds of characters long. In this case, a better solution would be wrapping text so that it displays on multiple lines rather than on one long line. Another possible way to accommodate long text is to merge several cells into one big cell. To do this, select two or more adjacent cells and click Merge & Center on the Home tab, in the Alignment group. This is how you use the AutoFit feature in Excel to increase cell size and make your data easier to read. I thank you for reading and hope to see you on our blog next week! 16 Responses to "How to AutoFit in Excel: adjust columns and rows to match data size"
Very nice and Excellent I admire your work and valuable knowledge you share. Thank you for your kind words, Mohammad! Our team will continue doing our best to bring the most interesting and useful features of Excel to our readers. I am using Excel 2016, have a workbook with 12 sheet, each sheet has 50+ columns. I spend almost as much adjusting column width as I do entering data. I have seen a VBA written so that each time you "enter" data the column automatically adjust its width. Unfortunately, I cannot get it to work in my version or Excel, which is 2016. I am wondering if you have something that would work? I already have one VBA that will do this for each sheet in the work book, but in order to run it I have to select alt+F8 and then select run. This is almost as time consuming at doing it manually and isn't what I am looking for. I would like to be able to type data and the minute I push the enter key the column should automatically adjust to fit the data. I have a query. I want to adjust data in one sheet to auto adjust value according to another sheet. as shown codes are same but may vary in rows. how to auto adjust the code different values to put automatically in front of their dedicated codes. I have been around spread sheets since Lotus 123 days and have read and reviewed hundreds, if not thousands of suggestions on Google and Youtube "How To accomplish a task using a particular program". I have NEVER seen a better method of explanation than what you have displayed here. Congratulation: Keep up the GREAT work. Thank you so much, Jim! It's a real pleasure to hear praise from a professional. If only it worked for me. I still have random spaces at the bottom of some of the rows. Tried the method several times with increasingly increased widths, to the point of ludicrousness, but there were always some that ended up with those extra spaces. When I use row autofit in Excel I find that some fonts work well in the setting, but most fonts do not work. First, why do I see the discrepancy? Second, what are the best fonts you see that work well with the row autofit? I've created a "form" in excel. One of the cells, A4 uses data validation from a list. Users select their item and the cell automatically adjusts to their selection. No problem; autofit works here. The user's selection then, triggers a lengthy sentence to appear, (using a VLOOKUP) in the same row, (row 4) but in column Z (Z4). autofit row height has no effect on the row when the VLOOKUP returns the lengthy sentence. I suspect excel is treating the autofit function on a first come, first serve basis. In other words, the first cell to autofit sets the size for that row. If I double click the row, of course it autofits, but I'd like it to occur automatically for the user. I am facing one issue . The solution for auto fit row height and it's alternate does not seem to work on my spreadsheet. - the row height to fit the contents, double-click the boundary below the row heading does not work.